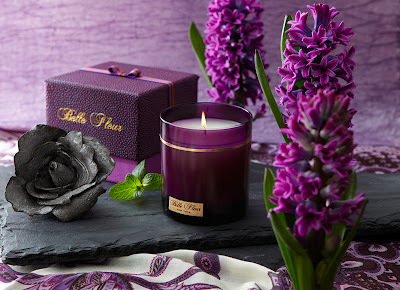 Belle Fleur describes Rose Immortelle as fresh, vivid and bold and it is exactly that. A fresh rose bud surrounded by red current. Ripe, slightly tart, and clean with a touch of lemon and mint. This is a great rose scented candle if you are looking for a lively fragrance. Of all the fragrances in the Rose Collection by Belle Fleur, this one has the most direct translation accurately reflecting the heart and soul of a rose bud. Burn quality 4/5. Fragrance intensity 3/5. Just curious, how do you determine the burn quality and fragrance intensity ratings? Do you have another post explaining this? Thanks! Hi Iris! Thanks for asking. I've been meaning to write a post about how I rate burn quality and fragrance intensity. Burn Quality: How well the candle burns without intervention. 1 - Poor. Couldn't get the candle to burn soot and smoke free without continuously trimming the wick or the flame wasn't sufficient enough to melt the wax. 2 - Not Good - a little better than poor but really needs work. 3 - Burned well but not great. Either the wick needed to be trimmed just right to burn well or the wax didn't melt at least half way to the edge of the glass. 4 - Burned well but didn't get all the way to the edge of the glass within 2 hours. 5 - Fantatstic! Perfect craftsmanship. The wick didn't need intervention (beyond possible one wick trim) and the wax melted even all the way to the edge of the glass within 2 hours. In addition to all of that, when the wax resolidified it hardened completely level and wax just as gorgeous as before it was lit. The candle left no wax residue on the glass. I've got to be honest - I think I only give 5 in burn quality to Rigaud candles are those are the only ones that are just as stunning after they've been burned as before. The wax is just gorgeous!!! 1 - Couldn't smell it at all. Might as well be unscented. Not worth paying for the fragrance becuase it isn't there. 2 - Could bareley smell or needed conscious effort to smell. 3 - Can smell but it doesn't overwhelm the room. This can be a great feature if you have a smaller space or you have company over and are looking for more of a background fragrance. Can leave lit for a several hours. 3 is not a bad rating for me as long as you are looking for something mild or using it in a smaller sized room. These fragrances can easily be layered with other fragrances in different rooms in the home without overwhelming. 4 - Can definitely smell the fragrance without effort in an average size room. Doesn't overwhelm - can leave lit for a few hours. These fragrances can be layered with other fragrances in different rooms in a home or can be amplified by more of the same candle in the same room or with a larger version of the same candle (ususally a 3-wick candle). 5 - Overwhelmingly fragrant. Fills an average size home. Can only leave lit for an hour or 2 in an average size room unless you like fragrance right up close in your face. These fragrances are great for people don't like anything less than 5 - they want to be overwhelmed with an extremely potent candle or for very large spaces. These fragrances don't layer well with other fragrances in different rooms as they will dominate the entire space. It's all personal preference and what you are looking for and the size space you are utilizing. For fragrance intensity - anything over 3 works depending on your needs.